[Rowling] said: "I wrote the Hermione/Ron relationship as a form of wish fulfillment. That's how it was conceived, really. For reasons that have very little to do with literature and far more to do with me clinging to the plot as I first imagined it, Hermione ended up with Ron." She added: "I know, I'm sorry, I can hear the rage and fury it might cause some fans, but if I'm absolutely honest, distance has given me perspective on that. It was a choice I made for very personal reasons, not for reasons of credibility. Am I breaking people's hearts by saying this? I hope not." Watson, for her part, seemed to agree with Rowling, commenting that she thinks "there are fans out there who know that too and who wonder whether Ron would have really been able to make her happy." 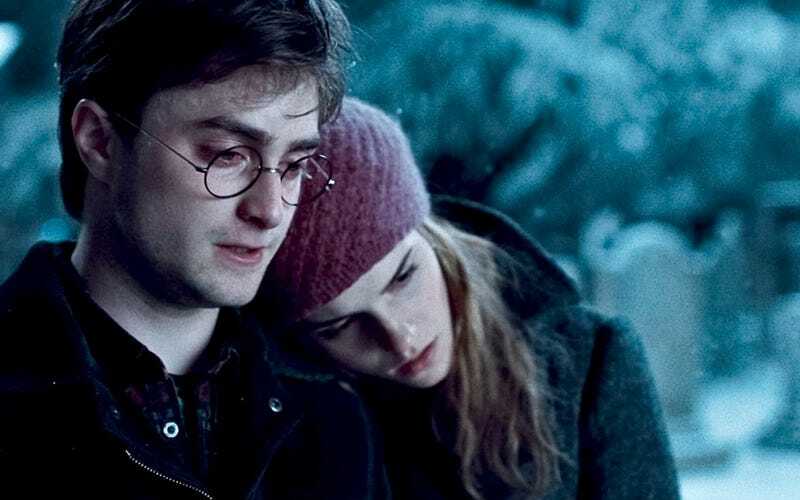 The comments obtained by The Sunday Times also seem to indicate that Rowling thinks Ron and Hermione "would have ended up needing relationship counseling." Oy. We can't help but notice that the Sunday Times article continues on page 7 of the paper, so it's possible that there's more to this story than meets the eye. Is this some sort of joke? A plot to drum up buzz over Watson's guest-editorship at Wonderland? Or has Rowling really, truly decided to rekindle the HP ship-wars into a category five wildfire? While we're waiting for the other shoe to drop, talk amongst yourselves – I'm betting some of you out there are feeling pretty vindicated right about now.